When rostering, there are some standard rules that apply across the board – for example staff can usually only work one shift at a time, so shift clashes are something that Ento will automatically flag and warn of on a roster. 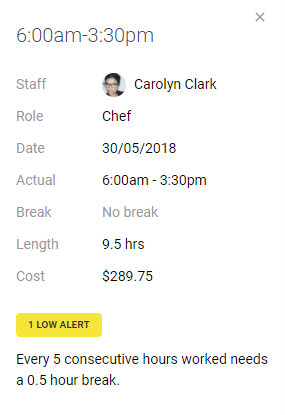 Other alerts may simply show that a staff has requested to drop or swap a shift. Other alerts can vary – where one business will want to be warned when overtime is triggered, another may want to put a block in place to prevent it entirely. Another company may expect to pay overtime and not want it highlighted on the roster at all. To support such varied business needs alerts can be customised, and alerts may even vary for staff from the same company on different awards. For any shift that is showing an alert, click on it and the information panel on the right side will advise why you’re seeing an alert so that you can investigate and resolve it. Critical alerts are used for shift clashes, and can be set for compliance failure with major award rules. Examples could be trying to roster staff after a hard set maximum number of hours per week, qualification non-compliance or the minimum time between shifts requirement not being met. Often used as warnings, alerting those rostering when they are about to perform an action that it would be better to avoid, for example where an overtime rate has been triggered, or where a rostered break is not long enough, but where rostering would still be allowed. When you try to add or change a shift that causes a warning, you will receive a small popup in the left hand corner of the roster advising there was an issue. You can hit ‘undo’ to revert the action, or you can ‘view details’ to see an outline of the warning. When viewing the details you can opt to ignore the warning and make the change anyway if your permissions allow it. A small bell icon on a shift is an alert to let you know that some action is required for a shift. 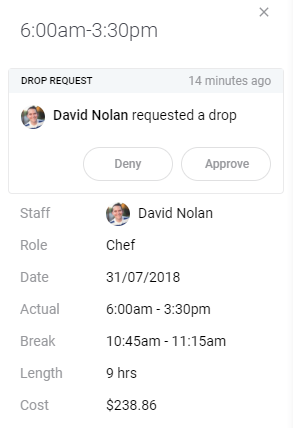 If your staff permission profiles are set to require shift acknowledgement, this bell will first appear if the staff still hasn’t accepted their shift 24 hours after the roster was published. Alternatively, if a staff has requested a shift swap/cover/drop and it requires manager approval, this bell will appear to let you know. The head icon means represents a shift that has been offered out to staff so they can pick it up. If it’s grey, there have been no replies, but if it’s green then a staff has advised they can work this shift and could be selected. Staff has requested to swap this shift with another staff, and it’s waiting for them to approve. The information panel will display action cards where some form of approval is required. Depending on the request, it will display more or less information, and give you action buttons to approve, deny, or view more information as necessary. What a manager can do in instances of low or critical alerts when rostering is controlled in each Manager permission profile. In some cases there may simply be a warning, in other instances the action may be blocked. This allows for hierarchical overriding, so while a rostering manager’s permission may block them from creating a shift where a low alert is triggered, while an operations manager’s profile may only give a warning when triggering a low alert, but still block for critical alerts. Your Ento administrator will be able to access the Rostering tab of your Settings > Manager permissions profile to determine what attempting to roster low or critical alerts will do. More on this in the Manager Permissions article.